The film literally opens with Adrien Brody awakening from a very deep sleep in mid-free-fall. Talk about getting out of the wrong side of the bed! His parachute opens automatically near the ground. With absolutely no idea where he is, he wonders through the jungle where he meets up with a bunch other other guys, who also woke up in the same situation. The characters are mostly armed with weapons and come from various backgrounds - some violent drug lords from Mexico or military folk. It seems they were going about their business when there was a bright light, next thing they know, they woke up here. Not a lot needs to be said about the plot. They are hunted by about 3 Predators and their pet alien dog things. It's pretty much exactly what you would expect from a Predator movie, nothing more, nothing less. Overall, there could have been some better deaths, but sadly the 15 certificate ruined any chance of that so the best death was the guy who gets his spine ripped out in one swift movement. Nice. I liked the fact that this was set on an alien world; they should have made a film like this a long time ago... in fact, they should have set the Alien Vs. Predator films here. At the risk of giving you a mild spoiler - I'm sure you won't be surprised to see the film ending with more parachutes coming down to the planet surface, so who knows, there could be more to come; I must admit, I wouldn't mind a bit. I'm sure they could do something interesting for Predator fans with a follow up if they took their time with it. 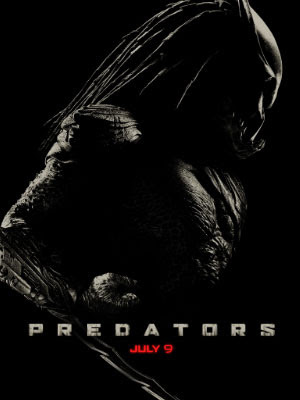 As a massive fan of the genre and both the Alien and Predator films, I found Predators an entertaining enough experience, but of course, non-fans of the series probably won't get so much out of it.